We are enjoying all the beautiful stonework your crew put in this spring, Thanks! Landscaping is much more than cutting grass, pulling weeds, and trimming the shrubs. 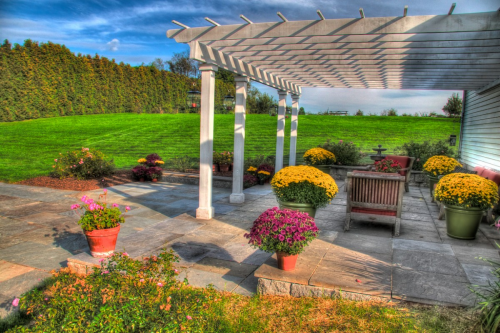 Coughlin Service Corp is a company providing complete grounds maintenance to customers in Middletown, CT. and the surrounding areas. With over 48 years experience, our skilled technicians provide professional service and can handle all the needs of commercial, and institutional customers alike. For Landscaping Middletown CT, Coughlin Service Corp has created a landscape management programs that bring out the best in your property. It is our goal to provide our clients with service that exceeds their expectations. At Coughlin Service Corp we work together with our Commercial and Institutional client to provide a daily property maintenace schedule to fit your needs. From daily litter removal, sidewalk, entryway and curb line clearing of dust and debris, to general daily touch up of all flower and mulch beds. Coughlins experienced staff can handle it. We can also design a Color Management program to ensure adequate color of all flower beds through out the ever changing New England seasons. With our single source provider solutions we can handle all your grounds and lot maintenance needs, with just one phone call.